George LAMB and Mercy ROSEBRIDGE were married on April the 8th 1880 at the Pentside Baptist Chapel, Dover. As is explained on the LAMB-CLUNES page, George died in an accident in 1887. A recently-discovered document suggests that Mercy lived until 1906 when she was buried in St Pancras cemetery in a plot bought for the purpose by her son, my grandfather. This plot was designated for four burials and another burial was made in it in 1941: until I have identified the individal concerned, I will not publish what I know about this second interment. At his death, apparently, my grandfather was concerned that he should be buried with his mother but, sadly, no-one knew at the time whether this was possible so he was buried in a grave belonging to Morden College, where he lived from the early 60's until his death. Now that I know where it is, I will visit the grave of his mother and, if there is a stone, I will investigate the possibility and cost of getting her son's name added to it. I believe that this photo (of a photo - original size approx 5cm x 3cm) was taken in the early 1880s, probably around 1883. 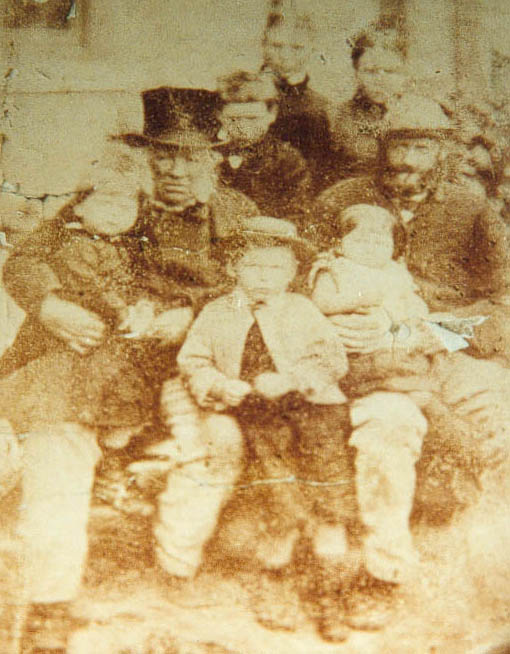 John Lamb (born 1809) is seated left, his son George (1837-1887) is seated right. Standing behind them are Alice (1869) on the left and Annie (1871) on the right. Just in front of them is Ernest (1874). Standing at the front is George (1875). The child seated on John's knee is Ethel (1878) and Sydney Richard (1881-1973) is sitting on his father's knee. Your opinion on this opinion, whether it agrees or differs, would be most welcome!